Amigurumi is the Japanese art of knitting or crocheting small, stuffed animals and dolls. Most of the time, when you see this word used they’re talking about miniature size, but if you search for patterns, they come in all sizes. This trend is huge right now in the crochet world. I first started seeing these about thirteen years ago when I worked in Classifieds. During slow times while waiting for calls to come in, I would search online for crochet patterns. Although the internet at the time was growing rapidly, websites were still quite ugly, and so were most of the patterns I found online. Books were still the best way to go. Lately, I’ve seen more and more cute crochet animal patterns. (I’ve pinned some on my Pinterest Crochet board). I used to think they were funny looking. I’m not sure if my exposure to them has changed my mind or if the patterns have advanced. I assume a little of both has happened. I’m sure part of my changing love of amigurumi is because my daughter loves them. 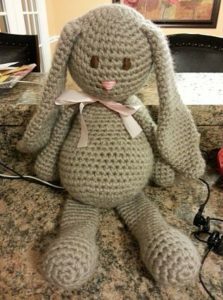 She’s a big stuffed animal person, preferring TY Beanie Boos to pretty much anything else, so I was a bit surprised that she requested I make this bunny. When it was done, she slept with it every night. She’s moved on to a newer stuffed animal, but this one still has a special place on her shelf. The pattern came from Edward’s Menagerie and was surprisingly simple, that is once I looked up how to read the pattern. It’s British and a little different than an American crochet pattern. If you decide to try one of these, rest assured, Google is your friend if you get stuck. I look forward to creating more of these cute animals. I especially like the dragon one. But…. I’m trying to limit my crochet to projects that are for presents or something that is useful, something that I will actually make. I’m guilty of buying yarn and supplies without having a specific project in mind. This is why my yarn stash is so large, and why I have several bags stuffed in nooks and closets with different crochet projects in various stages, all undone. I hope to get them finished one day. What about you? Are you into amigurumi?